The Dalhousie Faculty of Management is proud to pay tribute to the Honourable Justice Rosalie Silberman Abella, 2017 recipient of the Scotiabank Ethical Leadership Award. The award will be presented at the closing gala of the Ethics in Action case competition and conference on October 28, 2017. Justice Abella epitomizes the character, courage and devotion to ethical principles to which all leaders should aspire. She is one of Canada’s most influential experts in equality and ethics, and is a strong judicial advocate for the enforcement of human rights. 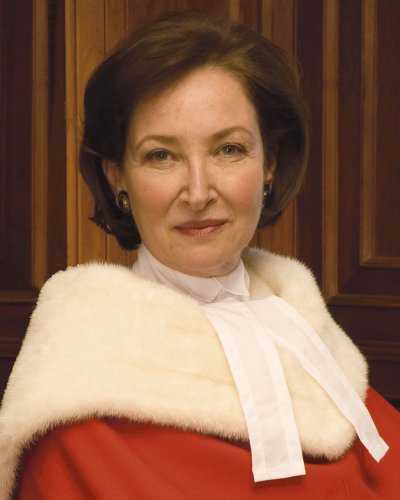 The first Jewish woman appointed to the Supreme Court of Canada, Justice Abella has been a member of the Court since 2004. As the sole Commissioner of Canada’s 1984 Royal Commission on Equality in Employment, she developed groundbreaking theories of equality and discrimination that today guide legislation and human rights in Canada, New Zealand, Northern Ireland and South Africa. She developed the concept of "employment equity" and coined the term. The recommendations in her report were adopted by the Supreme Court of Canada in 1989 in its first decision dealing with equality rights under the Canadian Charter of Rights and Freedoms. Justice Abella has a remarkable record of public service. She has served as Chair of the Ontario Labour Relations Board and the Ontario Law Reform Commission, on the Ontario Human Rights Commission and the Ontario Public Service Labour Relations Tribunal, and as Chair of the Study on Access to Legal Services by the Disabled. She is also an accomplished academic, and has authored more than 90 articles and written or co-edited four books. She is a Senior Fellow of Massey College, a Fellow of the Royal Society of Canada, a Fellow of the American Academy of Arts and Sciences, and has been a visiting professor and guest lecturer at numerous prestigious universities around the world. She is also active in Canadian judicial education. Born in a displaced persons camp in Stuttgart, Germany, in 1946 to Holocaust survivors, Justice Abella and her family came to Halifax in 1950 as refugees. Even before she started school, young Rosalie Silberman wanted to be a lawyer like her father. She attended the University of Toronto, earning a B.A. and LL.B. before her admittance to the Ontario Bar in 1972. At the age of 29, she was appointed to the Ontario Family Court, the youngest and first pregnant person appointed to the judiciary in Canada. Justice Abella is married to Canadian historian Irving Abella and their two sons, Jacob and Zachary, are both lawyers. Justice Abella has received no fewer than 37 honorary degrees and was recently named Global Jurist of the Year by the Northwestern Pritzker School of Law’s Center for International Human Rights in Chicago. She has also received the Distinguished Alumnus Award of the University of Toronto Faculty of Law, the International Justice Prize of the Gruber Foundation, and the Human Relations Award of the Canadian Council of Christians and Jews, among many other honours. The Faculty of Management established the student-led Ethics in Action case competition and conference with a $1.5 million donation from Scotiabank. The program engages business students and the Canadian business community in shaping ethical business leadership. The Scotiabank Ethics in Action Ethical Leadership Award recognizes a Canadian leader from a corporate, non-profit or government organization who has demonstrated and maintained outstanding ethical leadership. The recipient is chosen each year by a panel of student leaders from the Faculty of Management, as well as an ex-officio representative from Scotiabank and Faculty representatives.